I wanted to share something positive with my readers & fellow authors today, something which has touched me in such a profound way as a writer I think it bears repeating. 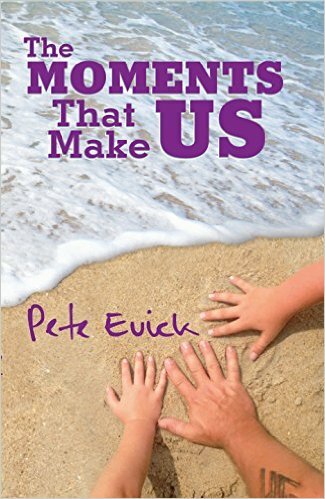 As I am quickly learning, Pete has become a major inspiration in my life since reading his new book, THE MOMENTS THAT MAKE US. This book has spoken to me on so many different levels, but none so much as Chapter Fourteen. There is no way I can possibly do this book, Pete, or the message behind the book justice, but if you will indulge me, I’d like to share a few passages from Pete’s book which has spoken the loudest to me. I hate to butcher the book and the message like this, but to understand the point of my post, I feel I must post a few excerpt paragraphs, even though I think the message does not come out as clear as it does when reading the entire chapter, or book, for that matter. I would like to point out this is not the entirety of the paragraphs, just small excerpts that have made the most impact on me. “…..The music of the era was powerful. I was sold on the energy and the sound. But Poison was different. While they made the trek to Hollywood to make it, they weren’t from the West Coast or some big city. Those guys were from a small town in Pennsylvania – just one state away from Virginia. Maybe that’s why I could relate…..
“Cry Tough” had struck such a nerve with me that I begged Todd to let me take the tape home that night. He agreed, and I played that tape over and over again. Suddenly, the second verse came screaming out at me. And there it was. The single most defining lyric of my life, to this very day…. I struggle on a daily basis with being a writer. Mostly, it’s guilt, a feeling of inadequateness with a good, strong dash of jealousy added into the mix. I’ve got to the point where I avoid FB like the plague because it stresses me out to see all the posts by fellow authors of new releases coming out, the author events, the launch parties, etc. No matter what I’m doing, I always feel guilty when I’m not writing. Never mind I have a full time job, a husband, kids, and a house to tend to. I know I have 900 different things that require my attention any day of the week, I know my regular job requires long hours and lots of stress that I had not bargained for, but I still feel guilty when I’m not writing. I know there is no way for me to push out a new novel every month or two, and if I did manage it, it would be utter crap and I wouldn’t be able to bring myself to put my name on it because I’m such a bleeding heart artist I refuse to put out anything I’m not 100% sure is the absolute best work -I- can produce. Mentally I KNOW these things, know I’m doing good to get a single book out each year, but I still can’t help but feel I should be doing more. I’m probably harder on myself than anyone else could ever be, know there is really no reason for me to feel guilty about the lack of time I have to write when I have so many other things I can’t put off which require my immediate attention, but yet here I sit, reminding myself I have 2 unfinished novels I need to be writing even though I have 2 closets that need to be cleaned out before school starts in a few days. Even though I know in the back of my mind that my department would probably crash and burn if I were ever to resign from my position, I still can’t help but look at my complete lack of success at both my regular job and my writing career and feel like I am a complete failure. What, exactly, have I accomplished in the last twenty-two years of my life? A few weeks ago I bought Pete’s book and read it during my lunch hours while at work. I’ve laughed, I’ve been brought to tears, I even saw red and wanted to psycho-momma on a certain unnamed teacher. But Chapter 14, aptly titled “Sometimes a Rainbow is Better than a Pot of Gold,” was the wake-up call I truly needed as a writer. I want everyone to sit and really think about that for a second. For me, the pot of gold would be a massive contract with a large advancement where I could quit my job and write full time and become a major bestseller, or better yet, the ultimate goal would be a multi-million dollar movie deal. But I also know getting that type of deal would come with deadlines, huge responsibilities, and more pressure than what I am currently under. Right now, I AM living in my rainbow. I have a great job, granted some days I loathe it and want to smack half the company, and I am certainly underpaid for the amount of work and total crap I have to deal with, but all-in-all, I can’t complain. When I have fellow coworkers and managers tell me quietly how much my VP thinks of everything I accomplish at my job, I know I am needed, even if I’m not really appreciated. It’s not exactly glamorous but I’m good at it, and I’m also lucky to have it. I often say I have the best of both worlds. I have a job which keeps a roof over our heads, with time spent away NOT thinking about books, and I also have this wonderful passion for creating stories which I am able to share with people thanks to Amazon and social media. But I think the simple fact sometimes a rainbow is better than a pot of gold gets lost on all of us. We are so busy chasing our dreams we forget to stop and appreciate what we have already accomplished. I’m not saying I wouldn’t jump at the chance to write full time, or work on a movie project, or any number of other projects, but I also am very proud of the seven books I’ve managed to publish in the past four years. It’s not exactly the dream career I wanted for myself, but it certainly is no small feat. I guess what I’m trying to say is, take the time to appreciate the small things you have accomplished. 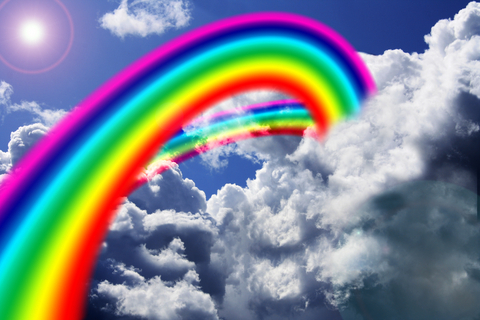 Live inside your rainbow and be happy to have it. Don’t ever stop chasing your dreams, but don’t forget to savor the ride. I never set out to be Anne Rice, and I think it’s time I stopped comparing my success to the success of others. I have always looked to Bret as my mentor, for giving me the drive to keep writing and chasing my dreams no matter what life has thrown at me. In the past year, I have become an avid Black Veil Brides fan who both admires the hard work and dedication they have to their music and their fans, as well as strive to remember they didn’t just have all of their good fortune handed to them. They worked hard to get it, and so I must too. Today, I came across another man who has also worked hard to earn what he has accomplished, and I am happy to add Pete Evick to my short list of mentors. Today, I am not just striving to keep chasing my dreams like Bret, but I am also striving to be more like Pete, and learn to be happy and appreciative of the rainbow I have, because right now my rainbow IS better than a pot of gold. So thank you, Pete, for being a totally awesome guy, and for sharing your words of wisdom and self-discovery with your fans. I can’t say enough about how wonderful and inspiring this book has been to me. And if I’ve went so far off base on the message your words were trying to convey, please forgive me! *Cry Tough – words and music by Bret Michaels, Bobby Dall, Bruce Johannesson, and Rikki Rockett. All copyrights to their original creators where applicable.